As we were collectively breaking ground on November, my coffee pot, a fancy KRUPS EC-311 model that I’d gotten on sale through Amazon, encountered an issue that I place firmly in the realm of time-lapse phenomena: it shut down prematurely. It would go through the initial cycle of brewing coffee, but either get bored with the same old challenge or just out and out lose interest in the process somewhere along the way. Let the record show, I’ve never lost interest in the end result that is produced when the magical coarse black powder is soaked in steaming hot water and the overflow is allowed to drip methodically into a glass container specifically designed for collection of the juices. 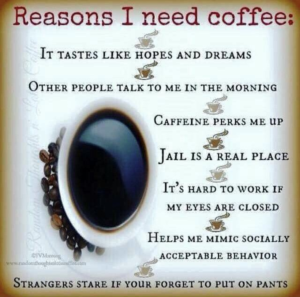 Some have described drinking coffee as a vice, others a virtue. I’m not sure that it’s either, but I heartily participate in the practice as a part of my morning routine, which I guess at least qualifies it as a habit. So when my fancy coffee maker failed, I needed to explore my options, and quickly. Tomorrow’s another day and having a coffee pot that no longer has a good grasp of time, how long to heat and pump water through the filter basket or how long to maintain the heating element that keeps the brew hot for future visitations of cup by cup harvesting, just won’t do. Option number one: Contact the manufacturer and demand that they replace the failing appliance. After getting only about six months of use out of the device, this seemed to be a reasonable expectation, but to my passive-agressive-turn-the-page-and-hold-a-grudge-behind-the-scenes nature, it seemed pretentious. Option number two: Hit the home section of Wal-Mart after lunch, in search of a suitable replacement. I really didn’t want to spend much money and at least one voice on my shoulder was telling me that I deserved a better fate, considering the money I’d invested in the fancy model. I was listening and other voices in my head were chirping in agreement with the voice on my shoulder. Option number three: Contact the manufacturer and ask about my options. This seemed like the best option and it probably should have ranked as option number one, but it came to me last. Hence, the designation as Option #3. My call to KRUPS USA resulted in a confusing call with someone who eventually determined that the appliance needed to be shipped away for service. The service center would either repair the coffee pot or replace it with a refurbished model of like value. They provided a prepaid shipping label and on November 1st, the pot was carefully packaged and placed in the care of a UPS representative, who assured me that “Brown” would take good care of my beloved, fancy coffee pot. After 3 days, I checked the tracking number on web and saw that the package had been safely delivered to a repair facility in South Carolina; over the next 3 weeks, I got not a word of correspondence. I was curious, but wanted to stay patient. Shortly after dropping the package at the local UPS Store, I had stopped in at Wal-Mart and picked up a $20, plain Jane, entry level Mr. Coffee device and it had been living up to expectations for 22 straight mornings. Yesterday, my wife told me that someone left a package on the front steps. Initially, I thought it was another pair of Puma suede sneakers that I’d been waiting for… I finally found green, but there was another shade of green that I wanted to compare with the green ones that I bought a couple weeks prior that have since been declared “Baby Poop Green” on my Facebook page. Yep… the color description stuck. Thanks Kelly. I unpacked the fancy coffee pot and sat it on the kitchen counter next to the cheap, Mr. Coffee appliance that had been so faithful over the past 22 mornings. Here’s where the wheels began to turn… I realized in that moment that it wasn’t about the pot, but the coffee. The coffee provided by the cheap coffee pot was just as hot and just as rich tasting as the coffee provided by the KRUPS EC-311 model that had finally come home. Interesting. Enter light fluffy clouds and warm fuzzy music. We’re entering into that time of year when we feel compelled to do something special for someone else (translate that into peer-pressure, if you’d like). Thanksgiving dinner has been reduced to a turkey skeleton that may or may not be suitable for a batch of soup and the Christmas Season, with all its joy (and angst) is upon us. We’ve all got a list of people that we “need” to get a gift for. We’ve check it twice, paired it down, perhaps even categorized it. Advertising will help us make decisions as to what they really want and what will bring them a good dose of “the joy of the holidays.” There are sales for all things extravagant and all things super affordable. Your list has subliminal rankings of those who you want to impress, those you want to really do something special for, and those who just need to have a colorfully wrapped package in their hands on Christmas Eve or Christmas Morning so they don’t feel left out or overlooked. The gifts are coffee pots. No, I’m not suggesting that you purchase each person on your list a coffee pot. I’m saying that no matter what you purchase, it can be represented in the coffee pot story that you’ve been reading for the past 10 to 12 minutes. The gifts are coffee pots and coffee pots at best. What people need… what people want… what people remember… what people cherish, is the coffee. As my story details, hopefully in a way that makes some lasting impression worthy of contemplation, is that fancy, schmancy coffee pots sometimes fail and cheap, git-r-done coffee pots sometimes deliver, when given the chance. There is a familiar saying that I’m sure many of you have used at one time or another, “Go big or go home.” As I wrote somewhere in one of my books, a more productive philosophy is to “Go small and keep moving forward.” If my memory was better, I’d tell you where that can be found. Often we plan big, elaborate things that we’d like to do for someone. Some of those plans never come to fruition, because while we plan “big,” we seldom execute “big.” We execute small. Another stumbling block is that our attention is given over to the coffee pot, when it’s the coffee that’s really important. My wish for you, as we tear into the opening days of the holiday season… focus on the coffee. Go small and keep moving forward, because putting a smile on someone’s face and a warm fuzzy in someone’s heart can be done any day of the year and coffee pots, whether fancy or entry level, always need replacing. Remember, the light at the end of someone’s darkness… May Be You.